By Pieter Bruegel the Elder. One of the most famous landscape paintings of the Northern Renaissance, Hunters in the Snow was originally part of a series of twelve landscapes ("Twelve Months") covering all the months of the year. Commissioned by the wealthy Antwerp banker Niclaes Jonghelinck, the work was almost certainly called January. Other surviving pictures in the series include The Gloomy Day (February) (1565, Kunsthistorisches Museum, Vienna), Haymaking (July) (1565, National Gallery, Prague), The Harvesters (August) (1565, Metropolitan Museum of Art, New York), and The Return of the Herd (probably November) (1565, Kunsthistorisches Museum, Vienna). Another celebrated snow scene by Bruegel, which is not part of the "Twelve Months" series, is Winter Landscape with a Bird Trap (1565, private collection). These panel paintings did much to secure Bruegel's reputation as one of the best landscape artists of Northern Europe. His unique contribution to the genre was to invest it with significant narrative on the rural mores and behaviour of 16th century Netherlanders. See also: Protestant Reformation Art (c.1520-1700). 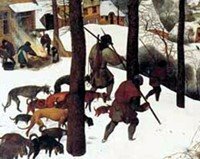 Also called The Return of the Hunters, this Bruegel oil painting - which is, incidentally the world's most popular classical Christmas card design - evokes the harsh conditions and temperatures of winter. In the foreground, three hunters are depicted returning from a hunting expedition with only a fox, to show for their effort. They and their dogs appear exhausted as they pass a small group of peasants "singeing" a pig to remove its bristles. The valley occupies the middle ground of the picture, frozen ponds and fields are dotted with skaters, while icicles hand from the mill wheel to the right. Bare trees litter the landscape. Fringed with mountain foothills and a cluster of jagged peaks (based on sketches made during the artist's 1552-3 trip through the Alps), the valley stretches as far as the horizon, populated by small villages laid out in the frozen flatlands. The entire scene is characterized by Bruegel's chilly colour scheme of pale green sky and ice, along with muted white snow - both set off by the dark browns and blacks of the trees, birds, dogs and people. (See also Renaissance Colour Palette.) It is a cold, gloomy late afternoon in winter - the season of barren earth, sleep and death. The composition is ideal as the first in a frieze of pictures covering the full year. Trees on the left make an ideal framing device, while the hunters intended path down the hill into the valley to the right leads the viewer easily into the rest of the "Months". In addition, the line of trees and the line of houses - both of which begin in the left-hand foreground and then follow the left-to-right downward slope of the hill - automatically give the picture instant depth. A further line of trees enhance the linear perspective by leading the viewer's eye into the centre of the valley. In fact, the whole picture is effectively structured around two main diagonals formed by (1) the left-to-right line of hunters, trees and left-hand edge of the frozen ponds/fields; and (2) the right to left line formed by the trees running along the base of the hills and peaks. As usual for a Bruegel, the painting is filled with detail. See, for instance, the tree branches 'dusted' with fine snow; the Inn sign inscribed with the words "Under the Stag" and an image of Saint Eustace; figures tobogganing, curling and spinning tops in the ponds; the firemen extinguishing a chimney fire; people shooting birds; the watermill with its frozen water wheel; and the village church steeples providing visual reference points in the far distance. Most of Bruegel's landscape and genre painting follows in the broad tradition of Hieronymus Bosch (1450-1516). Thus his art is rarely if ever devoid of religious significance. The meaning of Hunters in the Snow is simply that the man himself is a powerless entity, of no consequence, who is at the mercy of the natural seasons and rhythms of the year. The implication is, that only faith in the Creator and the natural (divine) order can bring us meaning and comfort. This is a low-key example of religious art, which - like a good deal of Netherlandish art of the 16th and 17th century - provides a very ordinary (even secular) setting, for its message. Hunters in the Snow - now acknowledged to be one of the greatest Renaissance paintings - was painted for the palatial mansion of the banker and art collector Niclaes Jonghelinck, as part of a large decorative scheme. Altogether Jonghelinck owned a total of sixteen paintings by Bruegel - among them, The Tower of Babel (1563), a Procession to Calvary (1564) and the Twelve Months (1565).  For more about 16th Century Northern Renaissance oil painting, see our main index: Homepage.